Hedgehogs houses can be very expensive to buy and there's no guarantee that they will use them even if you buy the des res of your dreams. Until you know you have a co-operative resident it might be worth building your own. You need to make sure the timber is thick, don't use plywood. Remember the house will be out in all weathers and it needs to stay warm and dry and preferably last the winter without collapsing. The plans here are fairly simple to make but if you really don't have the skills to wield a saw without requiring a trip to the emergency room, Ark Wildlife sell a very good one - click the house image above right - and if you mention Hedgehog Bottom, we are a charity partner and get some Brownie points. Any time of year. 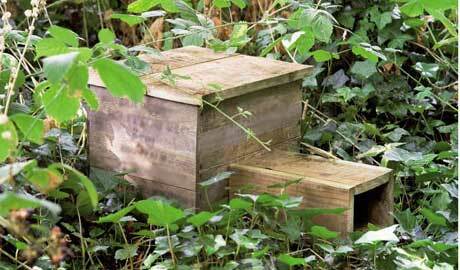 Hogs will use houses during the spring and summer as well as for hibernation purposes. If you're very lucky, a female may choose your handiwork to have her babies. Start by making the tunnel. Cut the timber into four equal lengths and nail them together lengthways. Make sure the opening is at least 10cm (4 inches) square. Use a saw to cut a hole (11cm x 15cm if you're using our suggested timber sizes) out of one side of the box close to the base. Drill a hole in the back of the box, near the top and insert the hose through it for ventilation making sure the outer end of the hose curves downwards to stop rain getting in. Attach two lengths of 2cm thick wood to the bottom of the box to act as feet and raise it off the floor. Screw or nail from the inside of the box. Use a saw to slightly angle one end of the tunnel. When attached to the box it should slope down to touch the ground. Nail from the inside of the box to attach it. It is now tempting to slap preservative all over your handiwork but if you do, no hog will go near it. I cover my houses with a thick green polythene but you can also use roofing felt or anything else that will keep the weather out. Two thirds fill the house with dry leaves or dust free hay, not straw, and replace the lid. 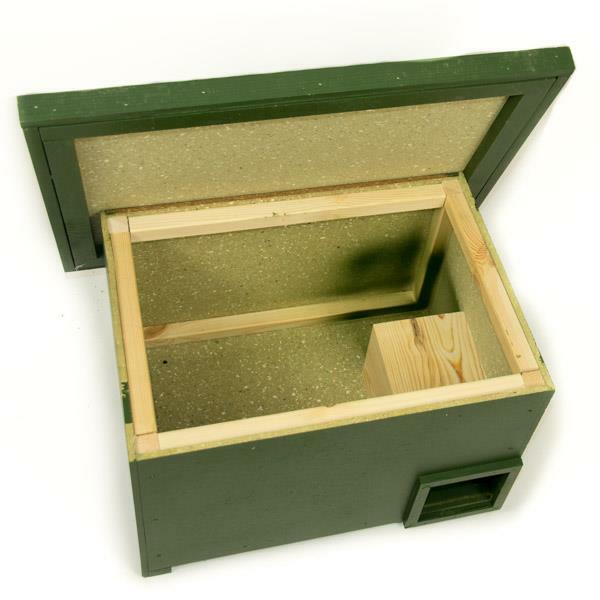 Hide the hedgehog house under some evergreen bushes or shrubs with the netrance away from prevailing wind. Place your house in a sheltered spot on well drained soil. Do not place it in a hollow, or bury it, as it will become damp or may fill with water during periods of heavy rain. Make sure the entrance faces away from prevailing winds. If at all possible, site it under a large evergreen shrub to give the hog cover when it emerges. If your local wine store doesn't have any spare crates, buy some extra timber and make one instead. There are lots of plans around various sites with houses of differing degrees of complexity. Some recommend using plastic crates. These are fine as long as you don't intend to leave them outside during the winter. In cold weather condensation forms on the inside and all the bedding gets wet. They do make ideal feeding stations though, as they stop cats from getting in and are very easy to clean.